Ask fellow campers about "Sandy Beach Campground (Parks Canada)" and nearby attractions. We were looking for a place to stay in Elk Island NP that would be central to hiking trails and other park offerings. We're self-contained and don't use the facilities except for an occasional shower. We stayed on weeknights in mid-July in our 8 meter (25 foot) MH. It appears this CG was previously called Sandy Beach CG. It is now Astotin Lake CG. This an interesting campground. The staff was friendly and helpful. There are 3 parts - general, walk-in tents and overflow (aka the RV loop). The general section is built into the side of an incline and has (mostly) back-in sites arrayed wherever they can be level. Although this part of the CG has trees for shade, there aren't many trees between the sites and not much privacy. The walk-in tent sites are a short walk from a parking lot with open spaces for 2-3 tents in each. The overflow/RV Loop area, where we stayed, is like a gravel parking lot with picnic tables and fire rings up on the curb. Half is set up for RVs or cars to parallel park while the other half is curb-lined perpendicular/back-in parking spaces with grass dividers. There are trees around the perimeter for some shade. There's no privacy. We chose a site in the back-in area. As it was half-full on weekdays, it was pleasant. All sites are primitive/no hook-ups. There's a dump station nearby and potable water in the CG. The showers were clean with ample hot water. We had intermittent ATT data coverage while roaming on weak Rogers service. Verizon was good with roaming on a stronger Telus signal. While the CG loses points for parking-lot-ness, it gains them back for convenient location and so many activities within walking distance. We camped at Sandy Beach Campground (Parks Canada) in a Motorhome. The parkway through the park was great for bicycling. There are 11 trails in the park with 4 leaving from the CG, and 6 within 12 km (8 miles) of the CG. There's a sandy beach and canoe/kayak rentals. (No motor boats allowed in Astotin Lake.) There's a nature centre with daily presentations near the CG and a vsitor center near the So entrance to the park. Wildlife viewing is available throuhgout the park. We enjoyed our stay at this Campground very much. There are various sites available for tents, motorhomes and smaller travel trailers. Big rigs and even medium size travel trailers exceeding 27ft might have problems getting through the rather narrow campground loop and are likely to be directed to the overflow or special RV-area. The main campground is located on a small hill so the view around through the trees on the nearby lakes is quite nice. The sites are in between the trees and rather private. Showers and restrooms are in very good shape and clean. Park staff is very friendly and helpful (as in all NP's). There are plenty of amenities around for a joyful stay such a trails, cooking shelters, a playground and even a golf course (of course to be paid separately) with an adjacent club house with restaurant (open to the public). During our stay, we have been able to see bisons grazing right in front of our trailer location. (Although the campground is fenced, bison are able to 'swim in' through the lake!) We camped at Sandy Beach Campground (Parks Canada) in a Motorhome. There are 2 campgrounds: the mixed use campground is gorgeous, nicely treed, some big spots. The park itself is huge and there is lots to do with kids, a lake to swim in, a nice playground, lots of walking trails, and a golf course with a clubhouse where you can buy lunch or snacks if you don't want to cook. The RV-only site is totally like a parking lot. 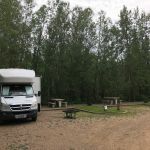 We camped at Sandy Beach Campground (Parks Canada) in a Motorhome. 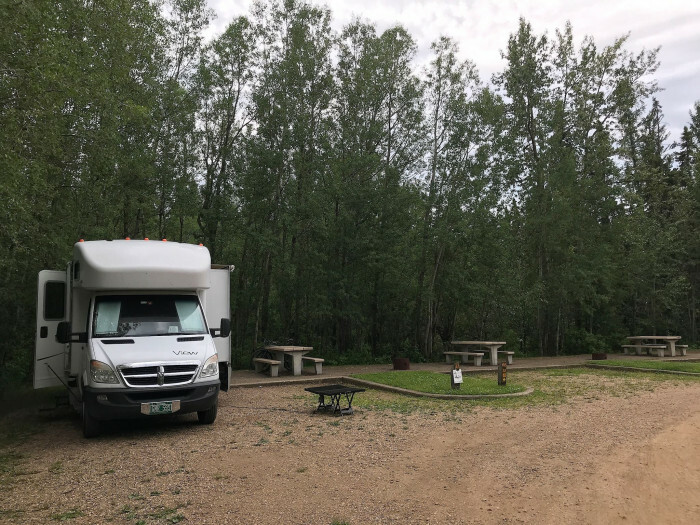 There are two campgrounds in Elk Island NP, both without hook-ups of any kind - one is for tents or trailers. It is the nicer of the two, with trees, fire pits, washrooms with lukewarm showers, and picnic table. It was rather empty when we were there, but it was during the week (we arrived on Monday, left on a Friday); we found good camping without a reservation but were told that they do fill on the weekends. The other campground is for RVs only, and is basically a parking lot with fire pits and picnic tables. It was empty when we were there, and it seems as if it would have a parking lot feel if it were full of RVers. We camped at Sandy Beach Campground (Parks Canada) in a Travel Trailer. I think it was originally designed as a picnic area. Sites are extremely close together with virtually no privacy from your neighbor. The rates, while high enough, are misleading - it will cost you $7 per person, per day to enter the park gates, plus $7 per night for a fire permit. The access road through the park is long, and in very poor condition. We camped at Sandy Beach Campground (Parks Canada) in a Motorhome. Are you affiliated with Sandy Beach Campground (Parks Canada) ?